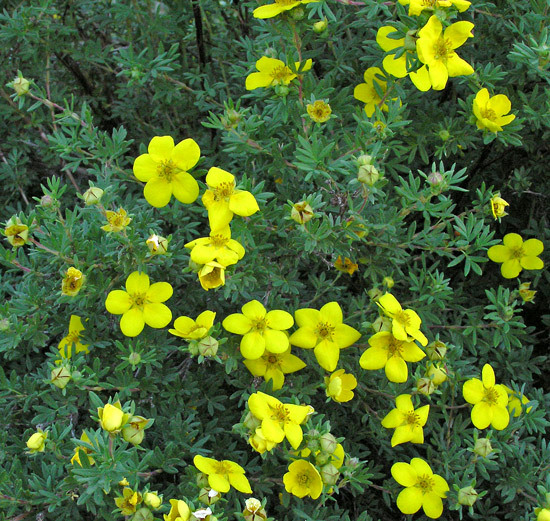 Shrubby Cinquefoil is the longest flowering of mountain shrubs in the Four Corners area, usually bearing flowers for three months. In the wild it grows to about three feet tall and wide. It is commonly planted as an ornamental and with abundant water it will grow to 5 feet tall and wide and flower for over four months. Dasiphora fruticosa is very common, especially in high mountain meadows along rivulets or occasionally moist areas where it can obtain the moisture it needs. It is common to spot long lines of Dasiphora fruticosa following a bit of a low spot across a meadow. Come up just a foot in elevation and the Dasiphora stops growing. Stems are long, slender, red/brown, and arch gently as they elongate. The plant pictured at left is about four feet tall and wide. Near Yellow Jacket Canyon, June 6, 2004. "Dasiphora" is Greek for "hair bearing" and perhaps refers to the hairy bark and hairy seeds. 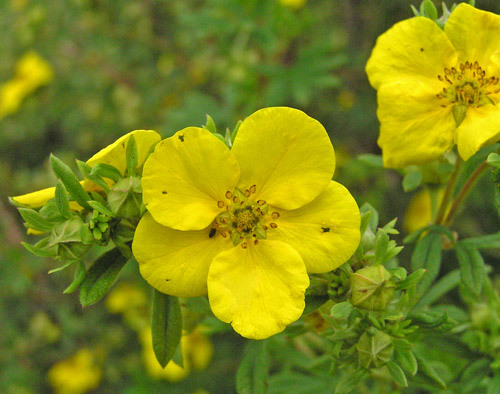 The genus "Potentilla" and species "Potentilla fruticosa" were named by Linnaeus in 1753. 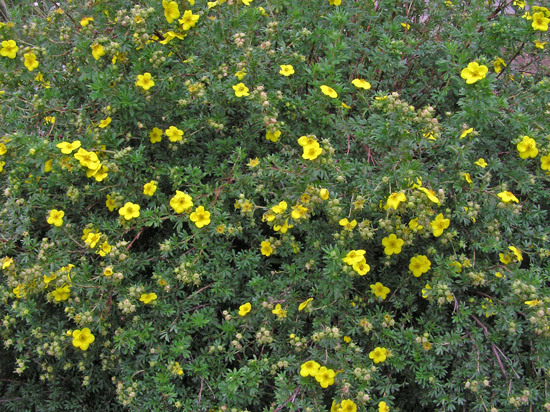 Frederick Pursh renamed the plant Potentilla floribunda in 1814, Rafinesque named it Dasiphora riparia in 1840, Rydberg named it Dasiphora fruticosa in 1898, O. Schwartz named the plant Pentaphylloides fruticosa in 1949, A. Löve named it Pentaphylloides floribunda in 1954. Dasiphora fruticosa subspecies floribunda is now the widely accepted name. 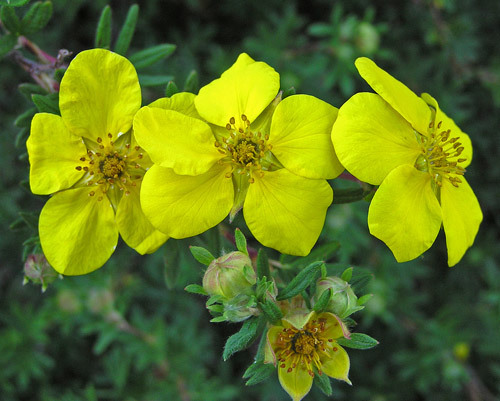 Colorado plant authority William A. Weber, believes the plant was most often classified as a Potentilla for nearly two centuries "purely as a matter of tradition". 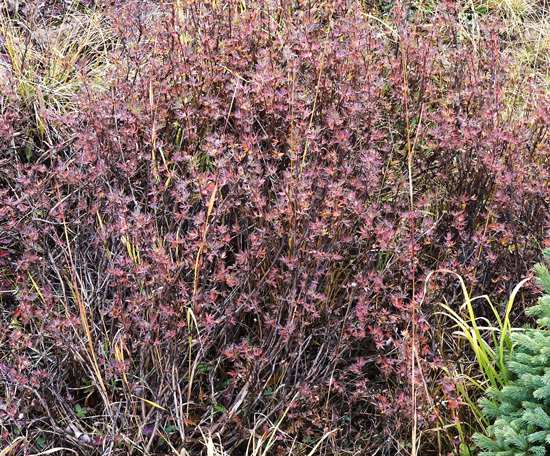 In his 4th edition of Colorado Flora, Weber calls the plant, "Pentaphylloides floribunda. Near Yellowjacket Canyon, May 25, 2004. Below El Diente, October 3, 2016. 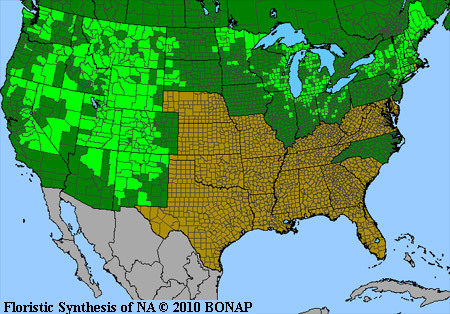 Fall colors are very subtle maroons.